Behold Istanbul's spectacular Sakirin Mosque. Believed to be the first mosque partly designed by a woman, it combines a sleek modernist style with traditional flourishes. Noted architect Husrev Tayla created the original plans for the mosque, which is situated in one of the city's oldest cemeteries. Fadillioglu and her team of architects where later commissioned by a wealthy Turkish family to re-work the plans, making design and architectural modifications. Zeynep Fadillioglu, the head of an interior design and architecture firm, completed the ground-breaking building in 2009. She is also the designer of two more mosques, both in Doha, Qatar. "Beneath the big dome you feel humility," said 59-year-old Fadillioglu. "At the same time, the beautiful chandeliers are much lower than normal, allowing people to feel more secure having this low light above their heads." According to Islamic tradition, worshipers are segregated by gender at mosques. 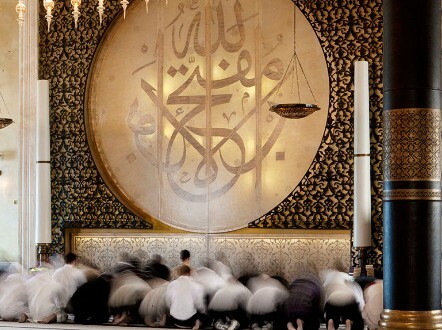 Fadillioglu wanted the female prayer area to be one of the most beautiful areas of Sakirin Mosque. "I positioned the women on the balcony level, with the chandelier crystal droplets just in front, and where you can see the mihrab [an alcove pointing towards Mecca] from the best angle," she said. She purposely painted the mihrab a "peaceful blue color." 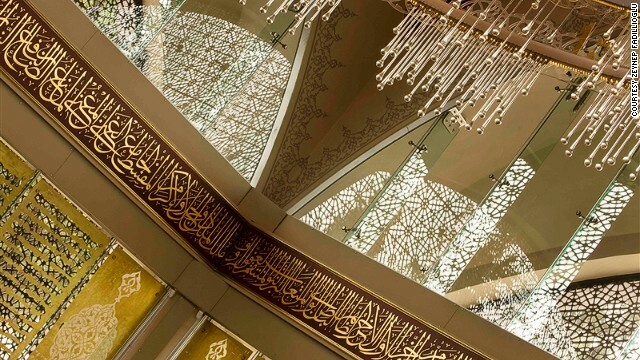 Rather than walls, huge windows covered in intricate metalwork allow light to stream in, "caressing you much like the pages of the Koran," explained Fadillioglu. The Golden Mosque in Doha, Qatar, was also designed by Fadillioglu's firm, and opened in 2010. Worshipers pray inside the Golden Mosque. "I think when you step inside a mosque, like any other religious building, you leave everything to do with the outside world, outside the door," said Fadillioglu. "It should be a place of serenity." 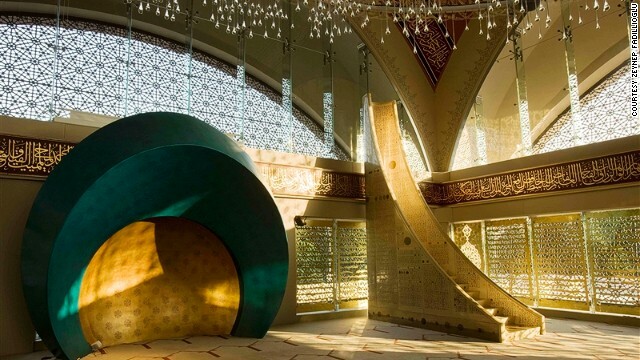 The mother-of-one -- who has university degrees in computer science and art history -- also designed the interior of the Friday Mosque in Doha, Qatar. 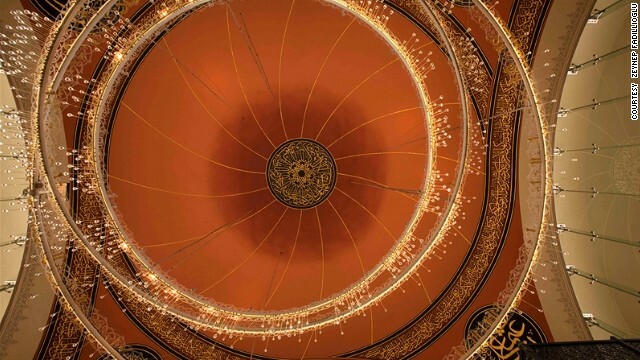 Islamic symbolism is an important part of Fadillioglu's designs. "It might be a color, it might be a texture, it might be a form. 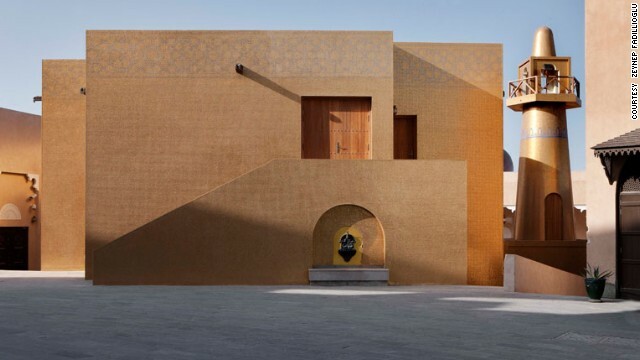 But each and every piece I have designed in the mosque has some kind of connection with tradition," she said. 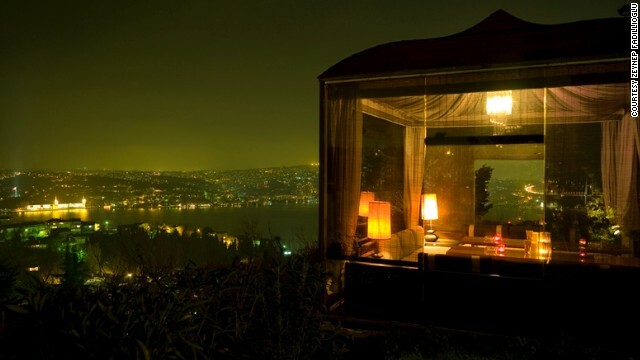 Fadillioglu isn't just known for her mosques, also designing nightclubs, hotels, offices, and Restaurant Ulus 29 (pictured), which features spectacular views of Istanbul. Inside a plush residential home created by Fadillioglu. 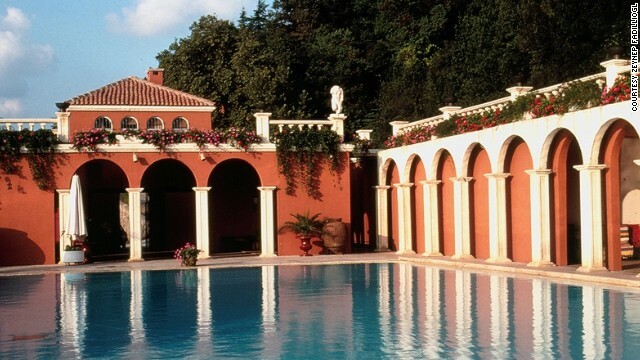 The swimming area of Istanbul restaurant and club, Çubuklu 29, also has the Fadillioglu special touch. 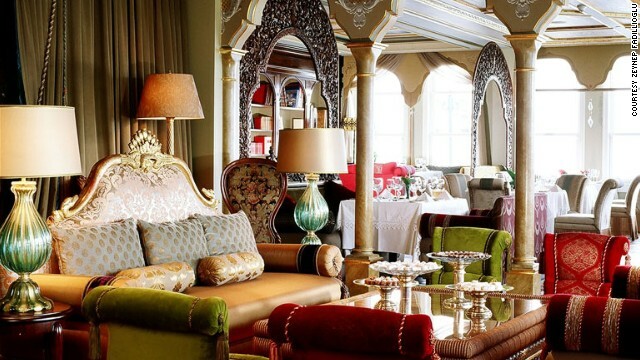 The city's boutique Hotel Les Ottomans is one of 350 projects completed by Fadillioglu across the globe. Editor's note: This article has been amended to acknowledge Husrev Tayla as the architect of the Sakirin Mosque in Istanbul, Turkey. (CNN) -- When it comes to buildings, they don't come much different than a mosque and a nightclub. In Istanbul, these two structures have more in common than you might think. Zeynep Fadillioglu is the designer behind both, her elegant creations blending sleek modernism with traditional ornamentation. 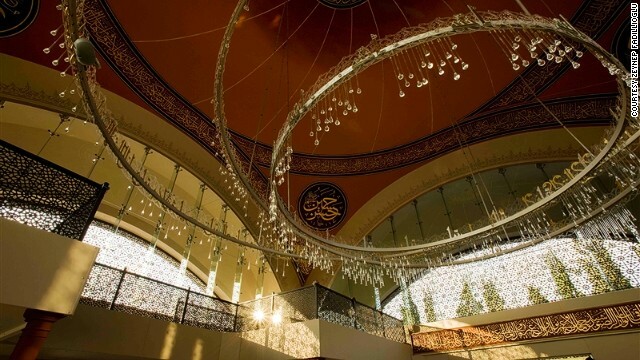 Crafting the inside of a building is hard enough, without also having to meet religious requirements, and Fadillioglu consulted Islamic authorities throughout the construction of the spectacular Sakirin Mosque -- co-created by architect Hüsrev Tayla -- and opened in 2009. It is believed to be the first time a woman has designed a mosque. 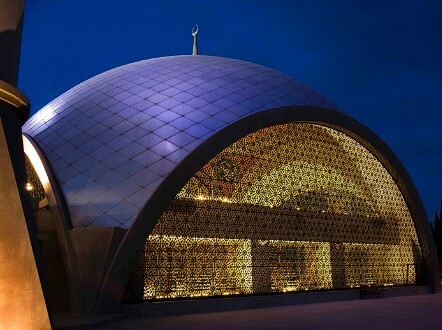 The 59-year-old has also designed two other mosques, both opened in Doha, Qatar, in 2010. But regardless of religion, every place of worship has one thing in common, says the mother-of-one from Istanbul. 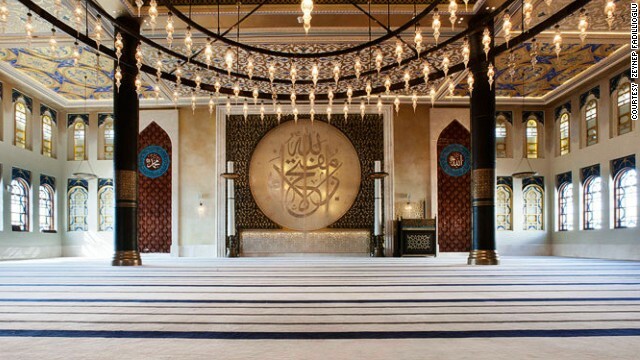 "I think when you step inside a mosque, like any other religious building, you leave everything to do with the outside world, outside the door," says the head of an interior design and architecture firm which has delivered over 350 projects across the globe. When not creating grand places of worship, Fadillioglu -- who has degrees in both computer science and art history -- turns her hand to everything from London restaurants, to New York retail stores, and most recently her own line of furniture. But when it comes to religious architecture, how do you design the inside of a building worthy of the divine? "Beneath the big dome you feel humility," said Fadillioglu of the Sakirin Mosque, commissioned by a wealthy Turkish family and built in one of Istanbul's oldest cemeteries. 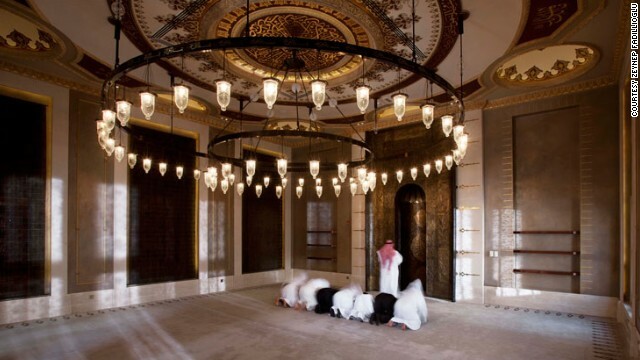 Inside Qatar's luminous Friday Mosque. "At the same time, the beautiful chandeliers are much lower than normal, allowing people to feel more secure having this low light above their heads." "It might be a color, it might be a texture, it might be a form. But each and every piece I have designed in the mosque has some kind of connection with tradition." 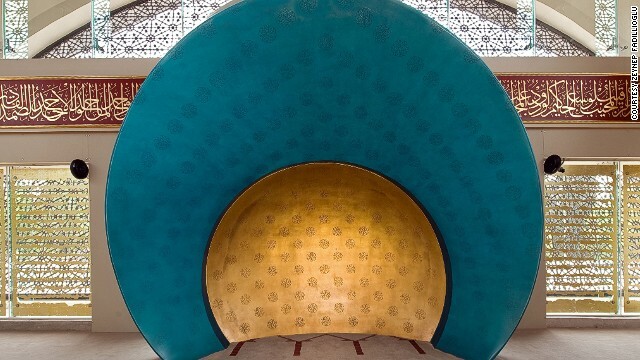 When the time came for Fadillioglu to craft the inside of Sakirin Mosque, she purposely placed the women's section in one of the most beautiful parts of the light-flooded dome. "I positioned them on the upper balcony, because during prayer the women must be behind the men," she explained. "But I also decided to make the balcony level one of the most beautiful areas, with the chandelier crystal droplets just in front, and where you can see the mihrab [an alcove pointing towards Mecca] from the best angle." Growing up in Istanbul, a city which straddles both the continents of Europe and Asia, Fadillioglu was influenced by a rich mixture of modern and traditional buildings. And while she always admired the craftsmanship of the metropolis's Ottoman era mosques, Fadillioglu had also become fed up with cramped and dark "bad copies." "I wanted to be very contemporary with my design," she said. "Up until recently, modern architects didn't design mosques -- it was always religious architects. 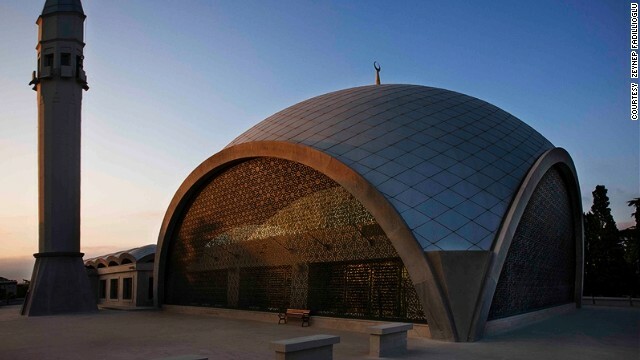 Sakirin Mosque: How do you design a building when your client is God? "A mosque isn't for a certain type of person, or certain type of area. It's supposed to be used by anyone and everyone. That could be foreign Muslims, or even Christian visitors coming to look at the building." 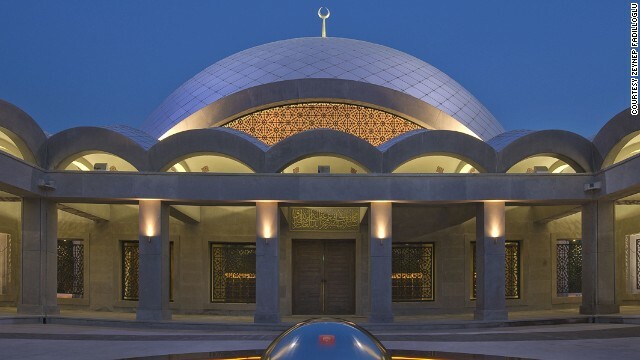 Fadillioglu might have made a name for herself designing mosques. But you needn't be religious to admire their beauty.